No problem Mark, just set it up and forget about it. Another one for my memory bank…. Your problem lies in the preferences menu, click “tools” and then “preferences”. Then change the “pieces reference>name” option from “panel type ” to “panel name”. Yes, I seem to be picking this up quickly. As a side thought. When I change the names of the individual panels in polyboard, they are not showing up in the cutlist with the different names, but do show on the model as such.. I sent your codes over to the developers, who are now calculating activation code, should be back to you later on today. If you need any manufacturing document sooner, just tell me and I’ll process for you. so thank you for your help on this. I just need my new activation code now for the new computer to finalise the cultists if you’ve got time to do that today that would be great. The terrace project has given me an idea for my garden so thanks for that. Thanks for answering Terry, Mark. I cannot find a better solution than what you have suggested. You are now a real master of PolyBoard. What I like about PolyBoard is that when you have mastered a few basic functionalities. You realise it’s a very versatile bit of software that can help to a lot of different things, and it’s good fun to. Made with PolyBoard cabinets assembled in project mode. This user now has a great system for showing off his projects in 3-D. I attached a compressed file containing the DXF and the SketchUp model. I’ve added a few dims to give you an idea of how it will look. For the window, just add another wall. The same width as the window, the same height as the window and make the elevation the same as the height from the floor. Then making sure its slightly deeper than the actual wall depth and once again make the transparency 100%. You will get a window opening through the wall and it wont appear in the cutting lists. It all seems so simple when its been explained. Im sure Ness will give some better answers, but here are mine to the two questions you asked. 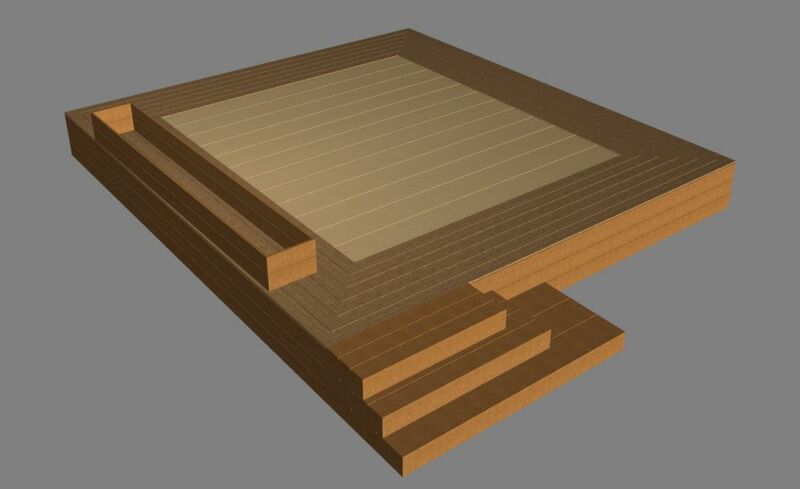 1) The end panels can be made and shown as laminated panels by using the Thickness Split edit. You will have to increase the model size of the end panel to 36mm thick first to allow the second panel to be included. You can then use the Thickness Split to make the end panel consist of 2 x 18mm panels that will look the same in the visual, but give a cutlist of 2 x 18mm panels that you make up to 36mm. 2) This is an easy one if I get the idea right. I presume you want to say add blocks under each shelf to allow you to assemble correctly as spacers etc. If thats the case, you can add a new material, lets call it ‘z spacer material’ and make the transparency 100%. You can then add the blocks or anything in reality use this new material. 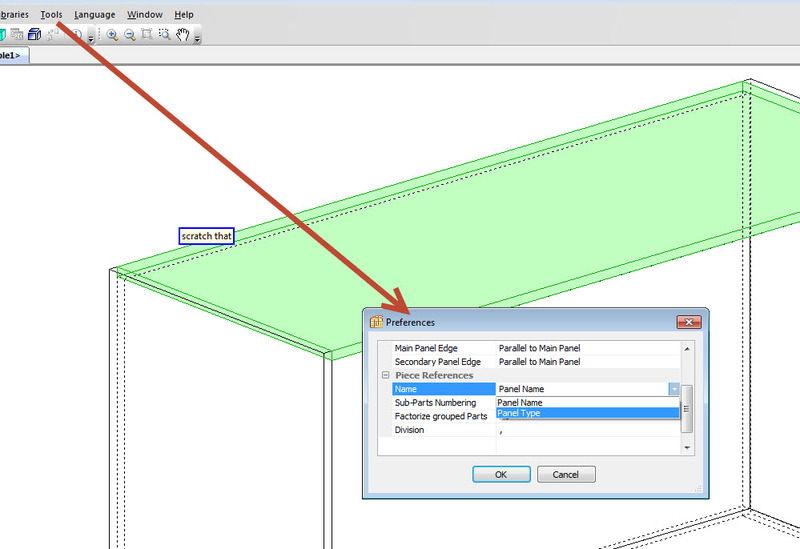 When you look at the visual they will not show, but will appear in all cutting lists as components with the ‘z spacer material’ description which means you can allocate scrap mdf as the material etc. Thanks for the emails today. I am about to make this modular unit of a desk with drawers, a counter and several display units above. Please feel free to laugh at my attempts at adding a TV screen and window I will not take offence. Whilst the work has been accepted and booked in the client was pretty keen on seeing a few more dimensions pertaining to the inside of the upper display units and TV screen computer area. So as this is not possible on polyboard (although I hope they eventually develop it) can you please send me the DXF files and the sketchup file that I will need to attempt to do this on sketchup. I don’t have sketch up yet but am downloading the free version as I write this. A couple of questions Ness about the project. You will notice on the base units Ive added 2 pieces of 18mm MDF to make up the end panels. This is for appearance and matches other fillers etc quite well. I would usually just glue these two pieces together and edge band them to make them look like a single 36mm piece, this saves me buying a whole sheet of 36mm MDf and having loads of waste. Is there anyway in polyboard to make to 2 end panels look like one without effecting the cutting list. I realise i could just change it to 36mm manually for appearance but then I’ve got to remember to change it back. when making bookshelves or the like that have a lot of panels such as shelves I normally cut a spacing jig to aid construction. is there a way to add a spacing jig that would show up on cutting lists but not on the imagery? Prob not but i thought Id ask in case I’m missing something.